Jacaranda will be publishing new digital editions of Jacaranda Geoactive 1 Stage 4 for the NSW Australian curriculum in 2017 for use in 2018. The title will be available as print (published in 2016) or a new eBook powered by learnON, the immersive digital learning platform that replaces eBookPLUS in 2018. Please visit the Jacaranda NSW Australian curriculum Geography page for more information. 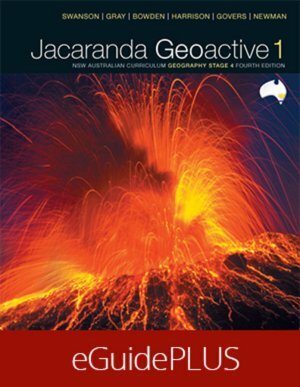 Jacaranda Geoactive 1 NSW Australian curriculum Edition Stage 4 eGuidePLUS (Online Purchase) provides comprehensive coverage of the new NSW Geography K-10 Syllabus. Jacaranda's unique, comprehensive reference resource SkillBuilder is fully integrated with the text, progressing student learning through a Tell me, Show me, Let me do it sequence. Geoactive 1 is the first title in its series. To view the rest of the titles in this series, click here. Topic 7 Fieldwork inquiry: How does a waterway change from source to sea? Topic 8: Where do Australians live? Topic 11: Geographical inquiry: What is my place like? Topic 16 Fieldwork inquiry: What is the water quality of my local catchment? Topic 20: For better or worse? Topic 21: Fieldwork inquiry: What are the effects of travel in the local community?